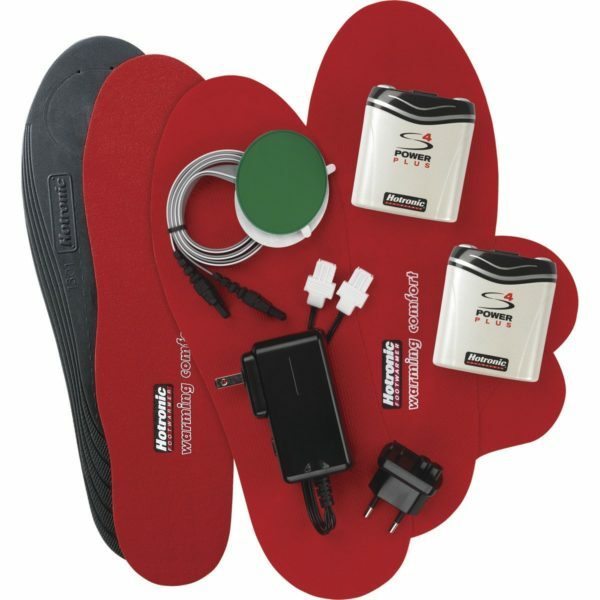 Hotronic FootWarmer are universal-size electric heated insoles that can fit any shoe size. 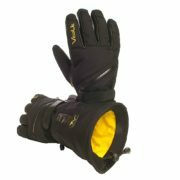 Perfect for any outdoor activity in freezing cold, including skiing, snowboarding, ice fishing, hiking, delivery, work, or simply walking the dog. Powerful batteries provide up to 8 hours of continuous heating. Three temperature levels are available depending on your needs and preferences. Hotronic FootWarmer electric heated insoles are trimmable insoles and can be placed in any size shoes or boots. 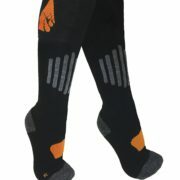 They can easily be made to fit any skiing boots, military boots, jogging sneakers or other footwear. 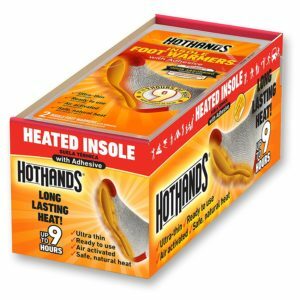 Hotronic electric heated insoles are designed for extreme cold and can work even in -22°F (-30°C). These electric insoles have powerful batteries lasting up to 8 hours on lowest heating. FootWarmers have three regular heating levels available: low, medium and high. Any of these can provide continuous heating to your feet. Fourth level of heat offers extra blast of heat. It’s intended to be used for a short period for quickly heating your feet. Hotronic’s S4 Universal electric heated insole model can be trimmed to fit into any boots or shoes. You simply trace your existing insole over Hotronic and trim it to any size that fits. 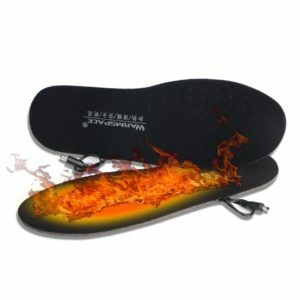 Hotronic’s Custom heated insoles are a different model and are not trimmable. Overall Hotronic’s FootWarmer insoles are a quality product with tons of satisfied customers. 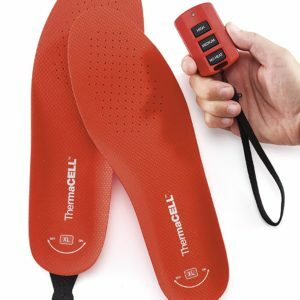 Even though the lack or remote control and high price is not working in their favor, these electric heated insoles will definitely keep your feet warm in any cold conditions. Really keeps the toes warm while skiing. Before this, my toes would freeze on cold days. Now, even on the first setting, my toes are toasty. The only drawback is the cable can get warped, so I duck-taped the cable. You can look in youtube how to install these fast. I bought this because my daughter frequently complained about cold during ski. It turned out to be a good choice for her. The batteries performed perfectly at 20 Fahrenheit weather in Eastern Washington. My daughter no longer felt cold for her toes. We used it from 10AM to 4PM for totally six hours and it worked perfectly well. I’m very happy for this product. 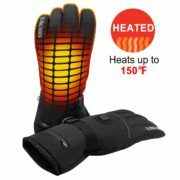 Bought these to where as I work outside even in freezing temperatures. Even at below freezing temperatures my feet stayed warm. They don’t last all day if I turn them up to the highest temperature, but my feet stay plenty warm at the medium setting and a couple of pairs of socks. At the medium setting they last all day. Would highly recommend these to anyone. I live in Alaska and I love to downhill ski. I have been skiing with toe warmers, but they aren’t comfortable or easy to get in the boots. These footwarmers are amazing, my feet do not get cold at -20F and it makes the day much nicer, since my feet aren’t cold, the rest of my body can focus on warming itself up! I recommend these if you are in a cold area and love to ski. I just returned from a one-week ski trip in Japan where I used the Hotronic FootWarmer insoles every day and I can say that for the first time in my life my feet were never cold while skiing!! The outside temperature was an average of 14 degrees and sometimes I would feel sweat in my boots! I like the 4 settings and how easy it is to switch from one to another. The batteries are heavy and I was afraid I would lose them, but because they were under the lining of my pants I couldn’t really lose them. The bottom of the lining is very tight around my boots so if the batteries did fall they would fall inside the pants. I put them on the sides of my boots and I could still operate the buckles. To make sure I understood the instructions correctly I watched an additional Youtube video. Big fan of these things. I had a surgery that limits my circulation in my left foot, and my toes are very sensitive to the cold. When I ski (snowboard, actually), this had been a real problem. No longer. These warmers keep me warm all day, and if I crank them all the way up it gets TOO hot. I had tried a million different solutions before this, but none of the other warmers had helped. These WORK, and the installation is pretty easy. You can find many YouTube videos to help you. It takes about an hour. I am one with poor circulation in my feet. You do not really feel the heat, but they tell you that. All I can say is they do keep me in the outdoors in the cold longer. Some reviews say they are hard to install, but those people must have a hard time reading instructions. I do wish I would have found these years ago. Easy to use and charge; I installed these on my own insoles (SuperFeet). So far skiing several days with temperatures around 10, I’ve been using the second setting. I formerly was using disposable toe warmers, and would typically go through about 30 packages per season. This electronic version is a definite upgrade, especially in the ability to adjust the heat level.